Revealed: How flipping websites offers you a unique way to get REAL online cash - FAST! *Ever wondered how to maximize the returns you make online by taking advantage of established websites for sale? *Have you considered creating a niche site but havent had the time to get started and wait it out for people to start finding your site? *Would you like to create revenue from taking existing websites and renovate this virtual property to build some steady income? Offline, there are countless people that have worked hard on real estate and property renovation, updating homes to sell on to eager buyers. These people can make significant gains doing this - but if youre financially not set up to buy a whole property - then flipping real estate for profit is unlikely to be a viable option. If the idea of applying this principle on-line sounds intriguing, then flipping websites could be the answer youre looking for. Forget about having to wait years to build up equity in a property of your own to make money living the renovators life... Id like to tell you about this fantastic opportunity to carry out a few virtual renovations to make some real money a lot faster - with a much lower financial outlay required to create positive financial returns. Everywhere you turn these days, you seem to come across people that are trying to sell you something online - and sadly people seem to make a lot of too-good-to-be-true promises about what you can make online. What makes it hard for many people to get started is either lack of knowledge or lack of income to invest getting to the nuts and bolts of how to genuinely make some money online. ...Or Swapping Real Estate Renovations for Virtual Real Estate! Not so long ago, I hit on the brilliant idea of renovating real estate for profit. My wife and I would work together and Id use my handy man skills to find and transform undiscovered gems into real estate treasure. Not such a bad idea - after all, the market was booming and the banks were more than willing to hand over money to finance my plan. With visions of creating a great future at a relatively young age - I was ready to get cracking. Of course, we all know what they say about the best laid plans.... Not long after we extended ourselves to the limit for a loan to buy a renovation property, my wife got pregnant and had to take time off work. Suddenly we discovered our great plan was going seriously off course - add to that the market was foundering and with all the money we had to pay on the loan we were no longer able to even think about doing up our do-upper. Not great news with a baby on the way! In desperation, I started an online search for a way to make some money, without draining any more of my seriously depleted finances... I was desperate to get some extra cash coming into our household. Looking for something that would really work for me, I quickly put aside the idea of an eBay business or selling products to family and friends - the start up funds were simply out of the question in my tight financial situation. What got me confused was how to separate the different ideas and how to find one that I could really get excited about and apply my passions to. I wasnt just after a get-rich-quick answer - I wanted to find something that would stabilise my financial situation longer term - both for myself and for my family. Just when I was about to give up and start flipping burgers in the evenings - I finally hit upon something that got me excited and enthusiastic about the possibility that I actually could achieve my financial goals online. I discovered not only that it was really possible to make money online, but I stumbled across a way to do so that genuinely fitted with my interests and took me from would be real estate flipper to an online master of virtual real estate. Best of all, it was bringing in that cash I needed too! If youre growing frustrated with trying to gauge whether making money online is a real possibility, then I urge you to hang in there! I experienced a deal of scepticism in my search for results, but it can be done. You can make an income online. I discovered that flipping websites gave me a chance to apply the skills I had offline to approaching this online income opportunity and really make things work for me. You do have to work, this isnt a get rich quick scheme - but if youre ready to learn what works - then Im here to teach you how to get started building your online income today. Flipping websites meant taking the undiscovered gems and creating online treasures. Just like I tried to transform houses, in the virtual world - Ive discovered how to transform websites into real money spinners. What gets me so passionate about it all is that Ive found a means of generating online income doing something I get a real kick out of! Earning Four Figures A Month! After worrying that I was going to let down my wife, myself and our soon to arrive baby - I was blown away by the success I achieved in just a short space of time. Sure, there was a learning curve - but once I got that sorted I was on track to success far more quickly than I ever imagined. There are a great number of things you can do when you purchase a website - the choices you make are likely to be dictated by your particular needs, interest and experience. Making Money With Your Computer Is FUN! What I discovered with website flipping is that I could achieve the goals I had set myself offline in the online environment. I got to do all the things I loved - seeking out a great deal, putting together a strategy and making money by improving the website. It was everything I hoped to do with real estate - at a fraction of the cost and with a much, much lower risk. It was a perfect choice for me as I was able to spend time with my wife (and now with our new baby), plus I was able to bring in that much needed income without having to spend long hours away from them. So knowing that it can be done - the next thing Im sure you want to know is how can you achieve these results yourself. Well thats what Im going to share with you now. I understand that you might be wondering - why would he share this information? Well the truth is, this is an area that is growing. That means that theres room for competition. I can share what I know and help you start achieving success today. Chances are that your goals, choice of sites and even the way you do your website flipping arent going to impact me. The internet is a big, big place and the choices are infinite. Theres plenty of opportunity to go around and I know what it is to be looking for answers. So today Id like to give those answers to you. My video series truly covers it all. Ive collated everything you need so that you can feel confident that youve got all the knowhow you need to get started with making money flipping websites. 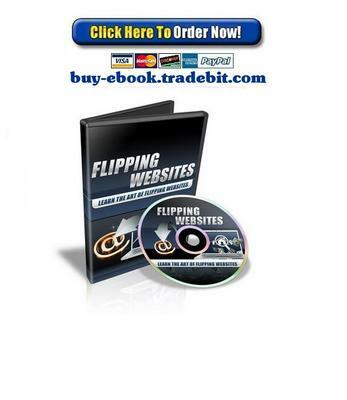 There are many ways you can build your wealth flipping websites. Once you know the different options available, then you can start by trying out just a few of the options or get stuck in and try out a number of options right away. If youre serious about building an online income then dont miss out on the wealth of information in these videos! Make A Start Today At My Special Low Price! When you weigh up the small fee for these videos, Im sure you can see that it is a small price to pay toward getting hold of this comprehensive, powerful information. When you purchase your own video series Flipping Websites you really get information that lives up to what is promised. My goal with this website is to ensure that you have all the information you need to profit and succeed in securing your financial future flipping websites. Whats more, right now you can get this for just $27. I believe that these videos truly give you the means to making a steady stream of income online. Having the knowhow to succeed is the secret to achieving your goals. If you want to finally be free of financial worries, then the Flipping Websites videos will teach you how for one low, low price. Everyone has a guarantee on their product, but I am willing to guarantee your success. I know this is different and radical, but I want you to understand that I believe in you, I believe in my Flipping Websites Video Series and I know that the sky is the limit once you discover the secrets I am willing to reveal. If you do not succeed, you get a refund, all you have to do is ask for the refund within the first 30 days of purchase and I will glady refund your money. No questions asked! Take advantage of this offer NOW and youll find that the Flipping Websites video series makes it virtually impossible to fail. to lock in the low price of just $1.99! Ultimate Site Flipping Secrets Pack + 2 Mystery Bonuses!